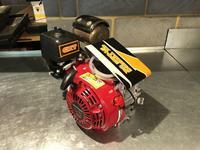 We are at GX Tuning Store UK have been building and specialising in the race preparation of GX160, GX200 & GX390 engines. We build all Honda GX engines to any specification and any rule package our customers require, whether it be MSA Cadets, MSA Prokart, Open Modified Prokart, Thunderkarts etc. Now, after over 10 years of research and development, we have the best engine packages available on the market and combined with our thirst to keep developing and improving our parts, machining and engines, our engines run consistantly at the front of the pack, winning races and collecting trophies not just within the UK, but also worldwide. Along with our engine's extreme performance, our engines also remain reliable. It's important to us that not only do our customers have the most power, but also that this level of performance is consistant for long periods of time between services. We perform all of our engine building and machining our selves on the best equipment available which is updated and improved regularly to ensure our engines are using the latest technology, so you're guarenteed to have a fully tuned racing engine from a championship winning engine tuner. We also stock the largest range of performance parts in the UK for GX160, GX200 & GX390 engines which we sell on our webstore to enable the 'DIY' engine builder to improve the performance themselves from home. It is vital to us that we stock a large quantity of all of the parts listed on our site for immediate dispatch. As we are kart racers ourselves, we understand the need for fast delivery for upcoming race weekends.